Veena (True story. Name changed) was 68 years old and had a heart stent for eight years when she came to us. She had developed allergy to aspirin, and was already using two blood thinners. Her doctor was considering ticagrelor (Brillinta, or alternatively, prasugrel) and wanted to find if she could continue on the cheaper drug, clopidogrel (Clopilet or Plavix). We found that, like 60% of the Indian subcontinent population, she had genes to efficiently use the cheaper drug. The newer drugs, ticagrelor or prasugrel, would have cost her at least $600 (Rs 36,000) more per year, and these are lifelong medications. As the test showed that Veena had the genes for the less expensive clopidogrel, she was advised so. Further, newer drugs, while useful in certain conditions, have their own toxicity profile, and much less safety data than older drugs which have been used by doctors for several decades! On the other hand was Teja (True story. Name changed), 55 years old, a heart attack survivor with diabetes, who was taking Clopilet (clopidogrel, Plavix) for several years. But he had had left shoulder pain for a few weeks now and was referred to us. We found that his genes could not use the cheaper drug at all, like 40% of the Indian and South Asian population. 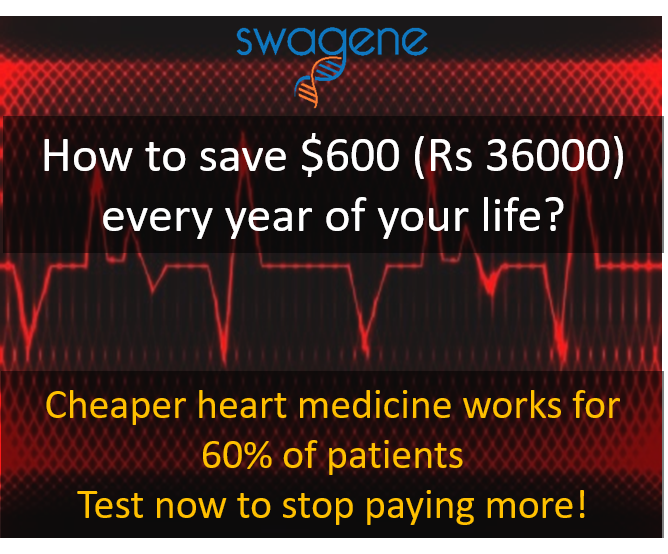 In this case, using the more expensive ticagrelor (Brillinta) Teja can save a lot of money from expenses related to emergencies, complications and subsequent hospitalization. Money saved is money earned! You too can find out how to save money. Find out ways you can reduce your healthcare bills every month for the rest of your life!